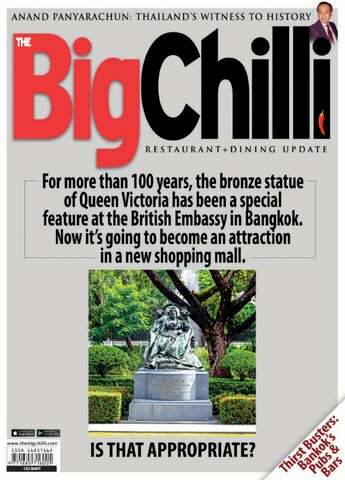 or more than 100 years, the bronze statue of Queen Victoria has been a popular feature at the British Embassy in Bangkok. Now it’s going to become an attraction in a new shopping mall. Is that appropriate? Of course not. Despite valiant efforts by the British Club Bangkok to have the statue of Queen Victoria relocated within its grounds on Silom Road, their pleas have fallen on deaf ears. It will remain in its current location after diplomats vacate the sprawling compound and tropical gardens later this year. The site was sold by the British government in 2018 for 20 billion baht, a record sum for a Foreign Office sale, to the Central Group, which plans to build a retail and commercial complex on the site. The Queen Victoria statue will become a major attraction and retail theme in the shopping mall. British residents point out that the huge statue, which is inscribed with the words “Erected in loving memory by her subjects in Siam”, was paid for by the British community at the beginning of the last century and should not have been included in the sale of the embassy to the Central Group. The statue was first erected in front of the British Legation in Charoen Krung Road in 1903 and was moved later when the British Embassy relocated to Wireless Road in 1923. It’s not only Brits who are outraged at the decision to leave behind this popular icon, describing it as utterly disgraceful, indefensible and even undignified. Thai people, with their deep respect for royalty, are also upset at the commercialization of a former monarch. A few years back, the British community was deeply upset when the front of the embassy grounds were sold off to the Central Group to make way for a shopping mall and hotel. They were further outraged when the remainder of this historic compound was then sold to the same company. Now they face another indignity with the loss of the Queen Victoria statue. One has to wonder whether much thought went into this most recent outrage. It is a decision with so little merit. Both seller and buyer of the statue should reconsider their position on this important issue. Happily, the War Memorial, another British Embassy landmark that also dates back to 1923, will find a new home at the British Club. The BigChilli Co., Ltd. 8/2 FMA Group Building, 5 Floor, Room 501, Convent Road, Silom, Bangrak, Bangkok, 10500.
term investment and that moving out of the embassy doesn’t cause any loss of prestige,” yet on a personal level he needs to move with his family at our expense to one of Bangkok’s most expensive new condominiums which I am sure most of us will never see the inside of. I am very pleased - and I think it is only appropriate - that the War Memorial is being relocated to the British Club Bangkok, but I find it extremely offensive that “as a concession to the historical importance of the British Embassy” the Central Group is not only building a replica of the ambassador’s residence but is also retaining the embassy’s iconic statue of Queen Victoria! This statue was donated by the Bangkok British community to the embassy in 1904 and should be relocated to the British Club, where a home has been offered for it next to the War Memorial, instead of it becoming some sort of cheap Chinese tourist attraction. It is very kind of the ambassador to take the trouble to mention the issue of frozen UK pensions to the next visiting senior government official although I am a little confused that this issue has apparently been caused by there being a reciprocal social security agreement with Thailand. Enquiries direct to the embassy have suggested that no such social security or healthcare agreements exists. I am very happy that Mr. Davidson and his partner are expecting their third surrogate child in March, especially since he has extended his stay here for another year as he sees it to be his job to make the embassy move as efficient as possible and getting the deal right and getting it done in this year of transition. But I am a little confused on what basis he is taking three months’ parental leave. Surely the physical stress of childbirth is not quite the same as a sperm donation! Still, having seen a previous ambassador banning sausages and bacon from the embassy breakfasts nothing surprises me anymore! There goes my Knighthood. David Williamson. Bangkok. West One Music links with top Thai musicians to create music for the King’s Coronation ■ ONE of the world’s leading music production companies has brought together top musicians from Thailand and the UK to compose a series of unique tracks dedicated to His Majesty King Vajiralongkorn on the occasion of his Coronation on May 4-6, 2019. This collaboration sees West One Music Group providing nine tracks from its library of more than 50,000 songs, with Thai musicians led by Somnuek Saeng-arun adding traditional instruments like the khim, flute, ranad and drum to create beautiful compositions with a distinctive Thai character. Other participating musicians were Prasarn Wongwirosuk and Lerkiat Mahavinichaimontri. All nine of these special edition tracks will be donated free of charge to TV channels in Thailand for use in programmes televising the Coronation. The recordings took place in Thailand last month at the Karma Sound Studios in Bang Saray. Heard on the Street All change in Patpong? ■ Two of Bangkok’s best known gay areas are apparently heading for the chop, with developers ready to demolish dedicated bars and restaurants on Suriwongse and Silom roads to make way for office and condo projects. Anticipating their closure, some owners have already acquired leases on new premises in Patpong 1 and 2.
steward denied theft and was subsequently found not guilty by judges in Dubai – “due to a lack of evidence.” Coincidentally, the Thai lady who lost money on her flight was sent a photo of the same suspect by the airline, and she was able to identity him as the steward who had attended her on route. The second BigChilli reader was not the only passenger on his flight (not Emirates) to lose money. A Chinese traveler sitting two rows in front also reported cash theft. After the airline in question showed no interest in his case, and even suggested the man could have flushed the money down the toilet, he contacted the police in Hong Kong who told him they received reports of thefts of his nature four of five times a week on Middle East based flights. “I will never fly on this airline which calls itself five-star again,” he said. The Thai businessman and his wife say they’ll choose Asian airlines in the future. OBIT : Wolfgang Otto Stuetzel ■ FORMER Bangkok resident and one time General Manager of the Royal Bangkok Sports Club Wolfgang Stuetzel passed away recently in Tanjay, Negros Oriental, Philippines. He was 78. Wolfgang was born in Bangkok during WW2 and held Thai nationality. He was known for his very British accent, love of jokes and a keen squash player. His sister Ariane Rodel-Stuetzel is often talked about as the reason Pattana school was built as their mother Rosamund was determined that her first born would have a proper English education. Wolfgang was married to Marie Lourdes (Malu) Navarro-Stuetzel, originally from the Philippines, father of Sabrina Kuschweski and grandfather of Julian. He was known as ‘Uncle Tito’ to all Stuetzel and Navarro grandchildren. The Beaver is being relaunched this year as The Caveman Classic. This legendary event goes has a rich tradition that goes back 38 years to 1980, when it was known as the Can-Am, and more recently as The Beaver. Itâ&#x20AC;&#x2122;s a fun golf weekend, where some 140 golfers converge annually, renewing friendships and making new ones over two days of parties and golf. The event will be supporting the development of an in-house bakery at a selected orphanage. From pioneer filmmaker,	high sea adventures and the amazing life and times By Maxmilian Wechsler Swedish filmmaker Ola Lennart Holmgren took to the road right out of high school in the early 70s and began working his way around Europe in the travel industr y. On the way he met Grete, the Norwegian girl he married and took back to Sweden in 1976. Ola had no training or experience in film production, but after deciding that’s what he wanted to do, he was unshakeable in his goal. With a period of apprenticeship, a little luck and a lot of hard work he made his dream come true: he launched a couple of big-time production companies that attracted top talent in the industr y. And he won around 100 awards while compiling a remarkable portfolio of celluloid and digital creations that includes feature films, television series and hundreds of TV commercials. Along with the success and acclaim, Ola’s decision to follow his calling in film also set him on a course for adventure and lots of travel, and through it all Grete has been by his side. In 2008 the couple came to Thailand to retire, but not surprisingly they continue to keep ver y active. They frequently go on trips around Thailand and Asia with the Siam Society and pursue a variety of interests in the local community. married. She wanted to go to Sweden because she found a job with ScandinavianAirlines, and of course I followed her. I did my very delayed, one-year mandatory military service, and after that I started trying everything to get in the film business. When you are very young and naïve you think that you can do whatever you want, and in a way this is good because then you learn that there are more opportunities than there are problems. This has been my motivation. hard-working junior assistant who won’t “The company was doing well, long before everyone wanted to do ask for too much money.’ This was me. working on various productions, but we commercials for television. The teacher arranged a meeting with only lasted about two years. Everyone “We grew fast, from 14 to 45 and then the company owner, who was a famous, had different personalities and ideas, 50 employees. It was a fun time and it old school producer who mainly did and we split in 1980. I started a new was hard work. I was using knowledge films for big companies. company, Mekano Film & Television gained at other companies, like you have “The owner told me I would be AB. This time I tried to find people who to take good care of your staff because on a three-month trial period without had similar ideas as mine. I also learned this is really your only capital. You have pay, and if I was good enough I could a big lesson: If you don’t have enough to motivate and treat people well so they stay on. Then he said I would start money to finance your business, you feel happy and see a good future in the the next day, which was fine company. We spent a lot of with me. Finally, he told money training the staff and me: ‘You will meet a very even sent them abroad. important client, but you “Later on we started Many of the people who used are not allowed to talk, just to produce TV programs, sit there and if someone including feature films. to work for me are now famous ask you something, don’t It was a good time, but directors, producers and actors. answer. Just say hmmm...’ extremely hard work. When I thought this was all a bit you are young it doesn’t Some are working in Hollywood, strange, but I realized he matter, but today I wouldn’t New York or London. had low expectations for do it. At that time I looked me and probably thought at it all as a challenge. We the less I did the better. The managed to make a lot of last thing the owner told me was not need to have a friendly relationship with money and even bought a little island to dress up in a jacket and tie because the banking industry. I tried to borrow for all the staff. Grete was still working ‘the people you will meet won’t like it’. money from several banks with no luck for Scandinavian Airlines, but at the “I stayed with the company for before one lent me the money with same time she was doing a great deal about a year and a half and tried to the condition that if I couldn’t pay the to support our company. learn as much as possible. In 1979 interest the bank was entitled to claim “I sold the company in 1988 to a big some colleagues and I opened a small everything I had. I agreed. publishing firm. When I discussed their production company called Film & “It was perfect timing. The same offer with my wife she said I should sell Video AB. We wanted to produce our month I got the loan Sweden finally because I was always working and she own commercials for TV. At that time decided to allow TV advertising. Two never saw me. She urged me to take Sweden was probably one of a few new commercial TV stations opened. all the money they were offering and countries in the world that didn’t have In a small country like Sweden with do something else. Many of the people commercial television. There were just 10 million people, this was very who used to work for me are now absolutely zero commercials on TV, big. We were the first ones set up to famous directors, producers and actors. but everybody was saying and thinking take advantage of this big change. Some are working in Hollywood, New they were going to come soon. We had no competitors, but it wasn’t York or London. “Grete and I began thinking more and more about what we wanted our future to be like. The first part of our married life was spent mostly in Sweden, the second in Spain, and now we were ready for the ‘third age,’ or ‘la trecera edad’ as they say in Spanish. We were getting older of course, and it seemed like it might be a good idea to take things a bit easier. “We decided to sell the company and retire in Thailand. We came to Thailand for the first time in the early 1990s on vacation and loved it here. Stefan Sanchez: In love with opera Brought up in a American-Mexican-Welsh family with a love of music, it was almost destined that Stefan would become an opera singer and teacher. His company, The Grand Opera Thailand, is now working on a musical called The Workshop (A Dress Rehearsal for Life) to be performed at the Thailand Cultural Centre next month Name: Stefan Sanchez. Nickname: Depends on a few factors. Like who’s saying it and why! Age: Ouch! Stefan Sanchez Director of European Chamber Opera (midscale global touring company), Holland Park Opera (founded the resident company), London City Opera (ran tours to the USA with Columbia Artists), Opera and Concert Worldwide (tours to Gulf States and South East Asia), Grand Opera Thailand (Thai touring opera company), BYO (Bangkok Youth Opera ) for young singers from 12 to 22, The English Theatre in Thailand (specializing in musicals and plays). Organizer and teacher of international opera masterclasses in Europe. And specialist in corporate cohesion (how to get the most value from communication in the work force). The project you’re working on today: Currently a simply wonderful musical called The Workshop (A Dress Rehearsal for Life). It plays at the Thailand Cultural Centre May 18, 19, 29, 30, 31 and June 1st. It stars Pete Pol and Yah Janya. Tickets from Thai Ticket Major. Your company and what it offers: My Company is called The Grand Opera Thailand, (www.grandoperathailand. up to the attic of the building to train with ‘Miss Peggy Bachelor’ I noticed singing going on in the other floors. So during a break from being a tree or some other such nonsense we used to do in Peggy’s class, I went downstairs knocked on the door of a venerable old professor of singing and said “Please sir, may I have singing lessons”…am very glad to say that approach was quite innocent and totally irresistible! Italy and Spain are historically the most notable for producing the best opera singers. Latin temperament, I guess, and very strong physicality. had just finished a jumble sale and the scoutmaster said half-jokingly, who wants this left over songbook by Amy Woodford Finden. Unsurprisingly mine was the only hand that shot up….So I had a great time singing and playing (I played piano from an early age) ‘Pale Hands I loved besides the Shalimar’ and ‘Less than the dust beneath thy Chariot Wheel’. Does that answer your question? as part of a variety programme at the Thailand Cultural Centre March 24 in aid of the Rotary Club of Bangkok South. They are super talented and well worth a listen to! and Spain are historically the most notable. Latin temperament I guess and very strong physicality. Stadium as a guest of George Michael. ladder for the courtiers of the Duke of Mantua who are kidnapping my own daughter - only I don’t realise it. At the point, when the chorus are meant to give me the ladder, the lead chorister whispers into my ear “You have to pretend cos we’ve forgotten the ladder.” “Where is it?” I whisper back.” “It’s in the bar, we stopped off for a quick one and left it there!” (translated from the original Spanish). Do you have ‘off days’ with your voice and how do you remedy it? Cancel. Is opera growing in popularity, with particular reference to young people? Here in Thailand it has grown in popularity enormously. How good is local singing talent? Excellent. My Thai students are eager to learn and without doubt the one major characteristic of almost all of the Thai singers is beauty of tone. Which institution here is doing the best job in teaching and promoting opera? The big universities that have conservatoires are all doing a splendid job. Any advice for a would-be opera singer? Get a good teacher! What’s your current state of mind? And health? Normal for an opera singer …extremely robust. Your best friend in Thailand: I keep making new ones so I can’t really say. Most interesting person you’ve ever met: Each person I meet has been an interesting experience ….some very positive and some extremely negative. I think much of my knowledge is a composite of interesting people and the valuable information they either hand to me directly or through my own research into them, dead or alive of course. Periodically I ‘taste’ my own conclusions via some sagacious pronouncement then realize I need a bit more seasoning and continue learning and refining. How do you spend your spare time? 555555555! I laugh because right now I don’t have any. Favorite vacation place: Now that I don’t live there any more I do love visiting London for a couple of weeks a year. Your favorite restaurant in Bangkok: Quince on Sukhumvit is one of my favourites. It’s a Mediterranean mix of extremely delicious food! Despite the brevity of both his tenures as prime minister, Anand is credited with a remarkable number of improvements to the Thai economy and life in general, though it is not clear whether they were properly appreciated by Thais themselves. Insight prominent Thai family, educated at two of Britain’s most distinguished institutions – Dulwich College and Cambridge University – his background and long career as an ambassador, permanent secretary of foreign affairs, his rare experience of business and industry, and his appointment, not once but twice, as the country’s prime minister, are unrivalled. Anand’s international outlook, his honesty and integrity have always resonated with the global community. Anand’s life wasn’t without the odd setback, most notably the sinister accusations in 1976 of him being a communist sympathizer, which caused him to call an end to a distinguished career as a diplomat. remarkable number of improvements to the Thai economy and life in general, though it is not clear whether they were properly appreciated by Thais themselves. Nonetheless, his approach to the job most definitely caught the imagination of expatriate businessmen who sincerely believed they were witnessing the dawn of a new age in Thai bureaucracy and style of leadership. Unfortunately, it wasn’t to be so. Anand’s life wasn’t without the odd setback, most notably the sinister accusations in 1976 of him being a communist sympathizer, which caused him to call an end to a distinguished career as a diplomat. Ironically, the military who wronged him then would later come running to him when they needed a prime minister. Critics have accused him of not being tough enough on the military after the ‘Black May’ violence in 1992, and also of being oblivious to military moves against the unions. It has even been claimed that he lacks ‘Thainess’ -- whatever that might be. Being in the spotlight in Thailand is clearly not easy. Author Dominic Faulder on the background of ‘Anand Panyarachun and the Making of Modern Thailand’ When I discovered more about Anand’s remarkably long career, which took off in his twenties, I realized that I would have to include a great deal of historical context – a major challenge in this environment. The book ballooned from a one-year project to six years and 250,000 words, and also became a parallel history. Is this your first book? No. It’s my first biography with my own byline. I have been involved in several other projects. For example, I co-edited and drafted large chunks of ‘King Bhumibol Adulyadej – A Life’s Work’ (KBA) in 2011, which has sold well and been translated into Thai. How did your involvement in this project come about? Anand chaired the KBA advisory board, and at meetings would often make references to his own experiences -for example, what it was like to be in the room with Field Marshal Sarit Thanarat, the prime minister in the early 1960s. Nicholas Grossman, the editor in chief at Editions Didier Millet, was very intrigued by all this and pushed the idea of a biography with Anand. Anand was frankly not too keen initially, and concerned about who could write it. He asked me how long I had been in Thailand, and I told him 30 years. We had already worked together on KBA, and I think he felt the book would need somebody with a long and balanced view of Thailand. Did you expect the book to run to well over 500 pages? It was originally supposed to be 80,000 words, but I soon realized I had bitten off rather more than I bargained for. time covers some new ground. The mechanisms that came into play at that time have never been well explained. Any comment about General Suchinda Kraprayoon’s disastrous assumption of the premiership in 1992, which led to bloodshed? You really have to ask, “What was Suchinda thinking?” Apart from anything, it was a personal disaster that disgraced the military and resulted in its withdrawal from politics for 14 years. The lessons of military political interventions have evidently not been learned, however. Not at all. It’s one of his qualities, and refreshing in an environment where too often things are left unsaid. He didn’t censor me, but he did counsel me on some treacherous areas. He likes to shake the tree and let the truth drop out. If he was mistaken about something, he would be happy for clarification. He is very easy to get along with in that sense, and also has an immense appetite for work once he gets on board with a project. One of the greatest accidents in history – Anand's description of his premiership. How did you get on with Anand during the writing of the book? Very well. He has a good sense of humour, and is very open to discussion. There were more than 60 meetings when we would go back and forth, trawling his memory banks. It was certainly not a standard journalistic exercise or confrontational. I was trying to find things out, not catch him out. There were things he had forgotten over the years, and others that surprised him. For example, he did not know that Lee Kuan Yew, Singapore’s prime minister, tried to help him in 1976 when the foreign ministry was being purged after the Thammasat student massacre. Could a Thai have written this book? Of course, but perhaps that is the wrong question. A better question might be to ask why more Thais have not been writing books like this. Partly it is to do with literary traditions here, which I discuss on a few occasions. There are also enormous institutional barriers to overcome and myths that need to be dispelled. Thailand, like other countries in Southeast Asia, has a fascinating history, much of it still waiting to be uncovered. I hope I have trapped a little of that in this book, and that it will be a small stepping stone for others. Anand is known as a straight-talker. Was that an impediment in any way? So you got on well? Yes, no problem at all. No arguments, but a few sparks did fly on the KBA project. He was very generous with his time and attention, and never testy about how long the project was taking. I sensed that his interest actually increased as time went by, and as it turned into something far more ambitious than originally envisaged. Insight but a bit longer. Of course, the publisher had plenty of sleepless nights worrying that the project might never be completed. Fortunately, Anand’s life is a compelling subject, and this drove the project. How many people have had such interesting and varied experiences? How did you manage to juggle your time with a full-time job? I managed. There were blockages when I needed to talk to people, or do other work. The book developed at its own pace. In 2015 and 2016, we met only four or five times. In the last year, I saw him 15 times. who have meteoric rises early in their careers. Having written this book, you must be ver y well informed about Thai histor y. At the outset, I suppose my knowledge was slightly better than average, but I actually used to dislike reporting Thailand -- I was much more associated with Cambodia and Burma/Myanmar. Working on this project of course made me aware of how much I did not know. I was also concerned that all the material Anand and others around him were carrying might be lost. How has the book been received, here and overseas? Nearly four months since the launch and getting on for 60% of the first run has been sold following mainly domestic and regional reviews. Because it goes beyond Anand’s life story, I hope it will have a long shelf life as a resource for people who want to know how Thailand was shaped in the late 20th century. The book should be available on Amazon in April, and it will be interesting to see how it does overseas, particularly Originally from London, Dominic Faulder has been based in the US where there are in Bangkok since the early 1980s and has worked for such strong connections. numerous news organisations and publications. He was The next step would be a special correspondent with the Hong Kong newsweekly a paperback edition to Asiaweek for many years, and had particular involvement chase after the student in the coverage of Burma/Myanmar and Cambodia in the market and more general 1980s and 1990s. He has been an associate editor with readers. Translating this the Tokyo-based Nikkei Asian Review since 2014. kind of work is a very tough proposition, but I hope it will happen one day. Did you have research assistants? Yes, and excellent translators too. They were essential. For example, finding Anand’s speech to parliament after he returned to office took ages. We weren’t so lucky with Henry Kissinger’s speech when he came here in 1998 at Anand’s invitation. Nobody kept a record of his address at an AmCham lunch. Astonishing. How long did the actual writing take? I would constantly rewrite and reorder the drafts – as many as 150 for some chapters. Sequencing is very important to ensure the reader does not get lost or baffled by some inclusion in an odd place. Editors, readers, and proof readers were also involved. I was always very interested in what they spotted, didn’t understand, or thought was off the mark. Writing is a form of madness – you are constantly talking to yourself. Having others involved in the process is therapeutic. Would you do it all over again? I have no regrets, but I shall look a lot more carefully before I leap if another opportunity arises. What’s next? I am doing a lot a more journalism than editing now for my magazine, the Nikkei Asian Review. It is all quiet on the book front at the moment, but longer term there are three or four interesting topics, all rather different. One is a historical tale from the Vietnam War era; another might best be described as political science fiction, and it goes well beyond Southeast Asia. I have no plans for another biography at present, but if I did one it would involve a team of smart young researchers to help with the heavy lifting. KBA took just eight months to complete with 14 writers, so there is a lesson to be had there. Writing books – is it lucrative? No. Terrible! How do you see Anand now? Perhaps the question should be how will others see Anand now. He once joked, “I suppose you now know me better than anyone else in the world.” That’s obviously not true, but I was struck when his daughters told me that they had learned new things about their father’s life. DESIGNED to resemble a 19th century apothecary shop, this favorite bar on Sukhumvit Soi 11 is renowned for the potency of its boozy concoctions – premium ‘remedies’ with names such as Vaccination, Doctor Cosmo, The Leech, and Cocaine Martini (a legal mix of vodka, Baileys, Kahlua, and Amaretto – just in case you were wondering). An outdoor area and nightly live music are other big draws, just what the doctor ordered. 33/28 Soi Sukhumvit 11, Bangkok 10110. WHEN all Irish themed pubs looked the same, think faux-rustic designs with green walls, Guinness posters and rusty antiques, Flann O’Brien takes its cue from Ireland’s contemporary bar-scene and offers a fresh and modern take on the tried-and-tested international Irish pub template. Pop in and enjoy a proper pint of Irish Stout. IMPACT Challenger Building, Popular 1 Road, Nonthaburi 11120. BEHIND this beer haven small back counter lay more options than we can count. Decorated as a tribute to the monks that brew beer in the monasteries of Belgium, at Brew Beers and Ciders you can find at least 6 out of 11 Trappist beers (beers made by monks) available to try. Want a match made in heaven? A cold one paired with Daniel Thaiger’s juicy burgers (arguably some of the best in Bangkok), we promise it won’t disappoint. 30 Sukhumvit Soi 11, Bangkok 10110. BANGKOK’S first Aussie pub provides competition to the numerous Irish and Pommie pubs that permeate the city. The Australian Pub and BBQ is a sports pub with live music located on Sukhumvit Soi 11, an entertainment area that needs no introduction. Whether for a date, a match, a night out with friends or a couple of beers before you hit the clubs, the pub guarantees some serious fun. 37 Sukhumvit Soi 11, Bangkok 10110. REMINISCENT of a classic British boozer in design and atmosphere, this popular venue is Bangkok’s senior pub, having first opened more than 25 years ago. Unchanged and unchallenged in lower Sukhumvit, the Huntsman is famous for its chilled draught beer, great wine selection, expertly mixed cocktails and authentic pub food along with some great Thai classics. The highly regarded house band keeps everyone well entertained and makes it a friendly, cosy pub that isn’t filled with people doing Jager bombs. The Landmark Bangkok Hotel, 138 Sukhumvit Road, Bangkok 10110. OPEN 24 hours a day, seven days a week for the last nine years, Mulligans on Khaosan road is undoubtedly one of the street’s most happening pubs. The atmosphere is always bouncing thanks to the popular house bands who play international hits and makes for a banging place to spend a couple of hours getting your booze on. 265 Khaosan Road, Bangkok 10200. AFTER relocating from their longstanding location on Sukhumvit 11 to On Nut last year, popular expat bar Cheap Charlies has a reputation for serving up great drinks that are easy on the pocket and that go well with its cool, laid-back atmosphere. This Sukhumvit 50 favourite draws a mix of regulars and wandering tourists alike, and we guarantee there’s something for everyone The Beacon Place, Sukhumvit Soi 50, Bangkok 10110. COMING SOON, the return of Hemingway (previously known as Hemingway’s), the muchloved pub that was demolished two years ago on Sukhumvit Soi 14. An incredible lookalike of the old house has been built a few blocks away on Sukhumvit Soi 11 and is set to become a magnet once again for locals and tourists when it finally opens in the next few weeks. great cocktails, rare whiskies and a decent wine list. Set over three floors, including an open terrace at the top, it can be a tight fit on Fridays and Saturdays. Smalls. 186/3 Soi Suan Phlu, Soi 1. Tel: 095 585 1398. Why cooking as a career? I love to cook and I love to eat. Two biggest influences on your career? My grandmother and Gianluigi Morini, patron two stars Michelin chef. Best early kitchen experience? My first time in the kitchen aged 15. Worst kitchen experience? Cooking at home. Best meal you’ve ever had? Every time I try create something new. What’s your cooking philosophy? Keep it simple and make sure it tastes good. What’s your signature dish? Homemade pasta. Most difficult ingredient to cook with? Ice - you can’t cook it. How do you keep in touch with latest food trends? Remember everything – and keep it in mind. Greatest achievement to date? Always in a good mood when cooking. Famous people you’ve cooked for. Barbara Streisand, Robert De Niro, George W. Bush, Giovanni Agnelli. Who would you like to cook for? My wife and daughter, which I always do anyway. Utensils you can’t do without? Sharp knife. Most influential chef? Valentino Mercatiilli, San Domenico. Imola, Italy. Music you listen to while cooking? I don’t listen to music - I listen to the sound of the frying pan! Best advice you’ve ever received? Lose weight. Radisson Blu Bangkok Born in Carmagnola, Italy, Danilo has extensive experience in Thailand, having worked as Executive Chef at Appia Italian restaurant in Bangkok, and Chef and Owner of L’Ulivo restaurant Bangkok, Italian Chef at Biscotti Restaurant, Four Seasons Bangkok and Chef at Ciao, Mandarin Oriental Bangkok. He’s also worked at San Domenico Imola (Bo) Italy, Hotel George V in Paris, Au Croccodile in Strasbourg, Hotel Mandarin Oriental Jakarta, and Hotel Mandarin Oriental Hong Kong For more information, email brewski.bangkok.blu@radisson.com or call +66(0) 2 302 3333. What’s your favorite dish to cook for yourself? Bruschetta with fresh tomatoes. Favorite dish cooked by someone else? Spaghetti al Pomodoro and basil. What is next for you? Have a nice glass of Barolo wine with beef stew. can pick their way slowly through a long list of delectable dishes made from the finest ingredients. The choice is actually quite stunning. Head for the numerous food stations where fresh seafood like King crabs, shrimps, New Zealand mussels and oysters is served on ice or prepared the way you like it most. are in abundance - Dim Sum, Paella, Sushi, Indian curries, Peking duck, Suckling pig and lots, lots more, including vegetarian options. Atelier also features heaps of scrumptious desserts, such as freshly baked pies and cakes, chocolates of every hue and flavor, along with popular Thai treats and tropical fruits – and as many of them as you like. The brunch buffet and free-flow drinks run until 3pm. But if you would like to continue this wonderful culinary extravaganza, Atelier’s signature cheese room stays open until 4pm – perfect timing to choose from more than 20 imported cheeses served with homemade bread, crackers and fresh fruits plus a bottle of wine. Priced at only 1,899++baht per person (including soft drinks), Atelier’s Sunday Brunch is more than just a remarkably good value dining occasion, it’s also about a well-deserved retreat from the busy world outside and a laid-back, casual and extremely satisfying experience. Atelier at Pullman Bangkok Grande Sukhumvit, 30 Sukhumvit 21 Asoke Road, Bangkok,10110. Tel: 02 204 4071 Pullman Bangkok Grande Sukhumvit features five-star accommodations and services in the heart of Bangkok’s Sukhumvit road. The hotel is ideally located near Asoke BTS Skytrain and MRT Sukhumvit underground stations. OOL, casual and contemporary is a great way to describe the stylish restaurant ‘Food Exchange’ at Novotel Bangkok Sukhumvit 4, conveniently located just moments from Nana BTS station. Offering a wide choice of cuisines from around the world in a trendy and relaxed setting with friendly service, the choice of large communal tables for families and groups or quiet alcoves for more intimate or personal meals makes this a destination for all occasions. hot wok dishes to order at the open kitchen, then follow up with an array of irresistible desserts. Food Exchange is open daily for breakfast from 6am to 10.30am on weekdays and from 6am to 11am at weekends. The international lunch buffet is served Monday to Friday from 12pm to 3pm at the outstanding price of 699 baht net per person, which includes free-flow soft drinks, coffee and tea. There’s even a special deal for certain credit card holders to get an amazing 50% off! Get together with family, friends or colleagues to share great food and good times at Food Exchange. Tel: 02 080 5323. Millennium Hilton Bangkok invited 3 Michelin starred Chef Jacques Marcon to join the hotel’s Executive Chef Shaiful Kassim to create a remarkable centenary celebration for Hilton Hotels with honorary guests and media in attendance. OLD Pulteney, the original Maritime Malt and an exceptional single malt Scotch whisky, unveils a new collection of four whiskies reinvigorating the core range while staying true to Old Pulteney’s rich heritage and traditions, with a masterclass held by the Pulteney Distillery Manager. Shanghai Mafia style speakeasy A hidden speakeasy cocktail bar, Honest Mistake, has opened in Aqua Ari - Saphan Kwai. With Chinese and Western design influences from the 1940s and 1950s, and the décor of Shanghai Mafia/pawn shops/ gambling dens, Honest Mistake offers 10 signature cocktails and attractions which include Mahjong table, gambling games without money, a CCTV corner, a Chinese paddle as a prop and a pawn shop entrance. ‘Home Away from Home’ D’ARK is opening at Iconsiam as a “Home away from Home”, a hang-out place for family and friends who want to enjoy a meal or just a great coffee together. Located in the Veranda zone, D’ARK offers a cosy mixology bar on G Floor, and a specialty coffee and whisky bar on M Floor, both offering amazing views over the river, and the daily music and light show, and a Josper charcoal oven. Bangkok’s Latest Lifestyle and Cultural Hub SIRI HOUSE at Somkid welcomes Thai city-dwellers to recharge and reconnect through food, art, culture, retail, and learning all in one easily accessible space. Relax at Bimini, sip drip-coffee at Luka, visit memory lane at Olympic Digger, create beautiful bouquets at Heart of SIRI by Heartmade, browse at Booksmith, and dine at Quince with cocktails at Jacqueline. Or just engage in ongoing experiences throughout SIRI HOUSE to help you unwind. Taiwanese buffet restaurant at Iconsiam Thailand’s CP Foods and Taiwan’s HiLai Group have jointly opened “Harbour” on the 6th Floor of Iconsiam, and at 2,000 square metres it is the largest buffet restaurant in Thailand. “Harbour” is recognised as Taiwan’s best buffet restaurant offering fresh seafood and 200 international food items including delectable dishes from Taiwan, Japan, China, Thailand, India, the West and Asean, as well as from top desserts from Europe and Japan. It is the venue that can satisfy all palates. Rainforest Rooftop Bar at Mövenpick Hotel Sukhumvit 15 celebrates the tradition of outdoor family barbecues with its “15 Yourself” promotion, which allows guests to meet on the rooftop terrace for a fresh barbecue accompanied by unlimited mezze platters with salad and specially all drinks at only 15 baht per glass for those ordering food! Available from 6-10pm for 777++ baht. remain drinkable for ten more years. It was a very classic textbook Cabernet with notes of black currants and leafy herbs. Elegant, layered and impeccably balanced, with fine tannin The next wine, Altrovino by Duemani (Merlot - Cabernet Franc) from Tuscany is a full-bodied red wine with balsamic fragrances, fruity, quite bitter and characterized by Mediterranean notes. Suckling scored it 93 and most agreed that winemaster Thomas Boedinger had made an excellent, courageous choice. Some were beginning to wilt, I think, when faced with Mango Mille Feuille accompanied by Raspberry Coulis, another tasty and beautifully presented dish; “a feast for the eyes” said Alex. How Pear, aged just ten, enjoyed success at the London Fashion Show By Special Correspondent ■ From making an enchanting video giving make-up tips when she was just three years old to participating in the London Fashion Week aged only ten – that’s the amazing life story so far of Natthanan ‘Pear’ Sanunrat, an extraordinarily smart little lady from Chantaburi. It’s easy to see why the cute four-minute video, which is still available on youtube, has garnered an astonishing seven millions views. It shows an angelic Pear offering advice while carefully rubbing in and dabbing on various cosmetics, totally oblivious of the impact it would have. Dad played a somewhat surprising part too by allowing Pear to use him as a try-out model for her make-up techniques. nasty social media bullying and only continued after words of support from friends, family and clients. So, what advice does Pear have about make-up? “It helps your confidence if you’re not confident about yourself,” she reckons. “But if you are confident about the way you look, you don’t need it.” What about the future? “I’m just concentrating on making youtube videos,” she says. And with so many followers already, that’s hardly surprising. round 30 ambassadors and other diplomats joined Thai officials and other distinguished guests in the ballroom of the Arnoma Grand Hotel for a night to remember. The Thai and Cuban national anthems were played and the ambassador gave a short speech. Then a Cuban salsa band began playing and Mr Almeida took the floor with Elena Olivia Conde Picans, his nine-yearold daughter. Guests looked on in amazement as they danced in perfect synchronization. On the 4th floor by the swimming pool, Cuban cigars and rum were on offer. The Cuban Embassy may not be as imposing as the sprawling diplomatic compounds on Wireless Road, but it has a personal touch that makes it no less impressive. Large photos of former President Fidel Castro, his brother and former President Raúl Castro and current President Miguel Díaz-Canel adorn the walls. Colorful brochures in Spanish and English are available to visitors. The Ambassador’s residence is nearby, situated in a quiet neighborhood off Sukhumvit Road. Some of the photos on these pages were taken there. The ambassador’s wife, Thelma Alina Picans Esnard, who also works at the embassy, prepared breakfast for everyone. About Cuba “In January 1959 the rebel army led by Fidel Castro, Raúl Castro and Che Guevara overthrew the despotic regime of Fulgencio Batista, whose dictatorial government was supported by the US. The revolution put an end to centuries of colonial and neocolonial economic, military and political oppression,” said Mr Almeida. “Prior to 1959, half of the Cuban population was illiterate or semiliterate and the infant mortality rate was more than 40 deaths per 1,000 live births. Now, thanks to universal and free education and health care, Cuba has reached almost 100% literacy and the infant mortality rate has dropped to around four deaths per 1,000 live births, lower than many developed countries. Life expectancy has risen from 58 years in 1959 to 78.45 years for men and 80.45 years for women today. In 2019, 51% of the state budget in Cuba is dedicated to education, social assistance and health-care services. Cuba has some of the world’s best medical schools, as recognized by the UN. “Gender inequality was eradicated by the Cuban Revolution. Women’s rights are flourishing in Cuba. In Cuba’s National Assembly, 53.22% of MPs are women – the second highest number in the world, and 48.4% of members of the State Council are women. Women represent 60.5% of all graduates of institutes of higher education in Cuba. Message from Ambassador Almeida On the occasion of 60th anniversary of the Cuban Revolution, Ambassador Almeida wishes to convey this written message: Sawasdee Khráp! Dear friends, Ladies and Gentlemen, January 1, 2019, marked 60 years of the Cuban Revolution, a historic milestone that put an end to four and a half centuries of colonial and neocolonial oppression in the Caribbean archipelago and established the first socialist country in the Western Hemisphere. The Cuban Revolution brought independence and dignity to the Caribbean State, eradicated illiteracy, gender and racial discrimination, environmental mismanagement and out-rooted the notion of corrupt puppet governments controlled by foreign powers. Today, the Cuban Revolution stands firm and proud on its principles of Peace, Social Justice, Anti-imperialism, Internationalism, Solidarity, Multilateralism and Respect for Human Rights and International Law. We are committed to the UN 2030 Sustainable Development Agenda; the Movement of NonAligned Countries, the 2015 Paris Agreement on Climate Change and the efforts by the international community to achieving the total elimination of nuclear weapons. On this special occasion we pay tribute to the historic leader of the Cuban Revolution, Dr Fidel Castro Ruz; to the People of Cuba, who are the main protagonist of the revolutionary process, and to the 50,000 Cuban medical doctors that save lives today in 67 countries around the world. We also honor the legacy of the Apostle of Cuban Independence and Cuban National Hero, José Martí, borne 166 years ago, whose 19th century revolutionary ideas are more valid than ever in today’s increasingly unequal world. On February 24, Cuba adopted a new Constitution which will be a catalyst in the updating process of our economic and social development model. Our new Magna Carta remains a cornerstone in the protection of Human Rights of the Cuban People, which include universal and free-of-charge Health Care services and Education for all Cuban citizens. Despite a fierce and illegal 60-years-old US blockade against the Caribbean Small Island Developing State, which is the main obstacle for our development as a country and is being strengthened through the Helms-Burton Act, Cuba strives to defend and build a sovereign, independent, socialist, democratic, prosperous and sustainable nation. Nothing will bend the Cuban people in that effort. Ladies and Gentlemen, It is with great happiness and honor that Thailand and Cuba are celebrating 60 Years of Diplomatic Relations, marked on May 15, 2018. On this historic occasion, I would like to convey my warmest regards and best wishes to all our Thai and Cuban friends, to the People and the Government of the Kingdom of Thailand. Celebration of this historic landmark in the friendly and beautiful Thailand adds to our profound feelings of joy and pride. Our two nations enjoy a long-lasting history of friendly ties and fruitful bilateral cooperation, bonds that are happily expanding today in the fields of public health, education, science, tourism, culture and sports. Thai-Cuban friendship and cooperation have been characterized by mutual respect and understanding and a shared vision of peace, prosperity, partnership, and people to people contacts. Both Thailand and Cuba have placed science, technology and innovation at the center of their sustainable development strategies. Our joint efforts in the area of biotechnological applications represent an important contribution to the wellbeing of our two Nations and a fruitful initiative within the framework of Thailand’s 4.0 Development Plan. We are reinforcing efforts to strengthen our partnership through enhanced interaction between the Peoples of both countries. We are also reaching out to the Thai people to introduce and better inform them about the opportunities and exciting things about Cuba in the context of the Caribbean archipelago’s updating process of its economic and social development model. Dear friends, I convey my sincere thanks to the Government and the People of the Kingdom of Thailand for their warm hospitality, support and cooperation to the Cuban Embassy in Bangkok. I would also like to thank all members of the Cuban community in Thailand for upholding the image of Cuba and for your outstanding contribution to the promotion of friendly ties between our Nations. In the years ahead, we look forward to further expanding our friendship and developing the bilateral relations between Thailand and Cuba, with special wishes of continued prosperity and happiness for our two Peoples and Nations. Khob Khun Khráp! 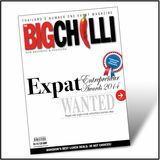 This is an abbreviated CV; the full CV can be viewed at wwwthebigchilli.com Personal data: •	Born: May 1, 1963, in Havana, Cuba. •	Language proficiency: Spanish, English, Russian. •	Marital status: Married with one daughter. Education: •	1982-1987: Graduate degree “Master of Arts in International Law”, awarded by the State University “S. M. Kirov”, Bakú, Azerbaijan. •	1991-1993: Certificate from International Atomic Energy Agency (IAEA). Received a fellowship to train on the administration and implementation of IAEA scientific programs and protocols. •	1995-1996: Master degree in European Union Law at Carlos III University, Madrid, Spain. •	1998: Diploma on Environmental Management, awarded by the Dresden University of Technology, Dresden, Germany. •	2004: Diploma on Environmental Management, awarded by the Global Environmental Centre (GEC) and Japan International Cooperation Agency (JICA). •	2012: Ninth University of Eastern Finland ‒ UNEP course on multilateral environmental agreements, Grenada. Professional work history: •	1987-1995: International Cooperation Officer at the Cuban Executive Secretariat for Nuclear Affairs. •	1995-2005: International Cooperation Officer for international scientific and technical co-operation at the Cuban Ministry of Science, Technology and Environment (CITMA). •	2005-2006: Deputy Director of the International Co-operation Department at the Cuban Ministry of Science, Technology and Environment (CITMA). •	December 2006-December 2011: First Secretary, Head of the Science, Technology and Environment Office at the Embassy of the Republic of Cuba in the People’s Republic of China. •	January 2012-August 2016: Deputy Director, Department of International Relations, Ministry of Science, Technology and Environment (CITMA), Republic of Cuba. •	February 2017 to present: Ambassador to the Kingdom of Thailand and the Republic of the Union of Myanmar. own 3-0 late in the second period of the a chance to tie it again and send it to another shootout 2018-2019 SHL final, Thai national team star Yean round. But Hertz keeper Dream Ungkulpattanasuk Thanakroekkiat started Hertz’s comeback with a stopped Forstner as he attempted a deke to the right side blast over TRUE goalkeeper’s Lance Parker left shoulder of the net, ensuring Hertz’s come-from-behind victory. and finished it off by scoring in the overtime shootout Dream, also a Thai national team player, was the playoff capping off a spectacular 4-3 rally to earn Hertz its second MVP, stealing the thunder from opposing keeper Lance straight SHL title. Parker, who last year won MVP honors leading Hertz to TRUE jumped out to an early 3-0 lead on goals by Tan its upset victory over AWARE. This year, Dream played in Limpinphet, substitute Hideki Nagayama and Kim Lidberg, pivotal role in Hertz’s semi-final upset over number-one who played for Hertz last season. Hertz replied with Yean’s seeded AWARE, who had finished the regular season with blast, then came within one late in the second period on a a 15-3-0 mark compared to Hertz’s 6-12 record. very strange goal when the puck bounced off the top of the TRUE themselves put on quite a turnaround as early in TRUE net behind Parker, and then bounced off Parker’s the year the team was 0-9 but after picking up Forstner at back into the net (the goal was credited to Andy Brine). mid-season their fortunes began to change and they ended The momentum shifted Hertz’s way at that point and up finishing in third place with a 7-10-1 record upsetting they scored the tying goal when Champ Supadilokluk the second-seeded Novotel Spitfires (8-6-4) in the other blasted one past Parker midway through the third period. semi-final. The teams then played four minutes of 3-on-3 overtime It was the third straight finals appearance for captain but the score remained knotted at three. Yean then scored Justin St Denis and Hertz, who in their first SHL season on his shootout chance, leaving Patrick Forstner with were sponsored by Hooters Nana. Bloggers check out Steakhouse The Steakhouse Pub-Bar & Grill invited some of Thailand’s top food bloggers to check out the venue’s cuisine, including its steaks, ribs and burgers. Steakhouse Co is one of the newest restaurants in the Silom area of Bangkok. Thailand’s winning Campari bartender Campari Group and Vesper restaurant hosted the Campari Bartender Competition Thailand 2018 ‘Thank You Party’ for Supawit Muttarattana, Bar Manager at Vesper, who became Thailand’s first-ever winner of the Campari Bartender Competition ASIA, which was held in Milan, Italy, with more than 350 bartenders competing. Women empowering each other Members and guests of Empowered got together for another great event offering good advice with a touch of glamour entitled Women Uplifting Women – It’s Time for Women to Uplift Each Other,” held at Zuma, St Regis Hotel. Founded by Natalie Glebova and Dr Patama Mokaves Dumas, Empowered teaches young people to master an empowering mindset and competent life skills, so they can happily achieve their goals in life. Jazz at Sala Sudasiri Sobha The beautiful concert hall Sala Sudasiri Sobha in Ladprao, Bangkok, held another fantastic event featuring modern jazz by African singer Yasmine, her husband the Danish saxophonist Jacob Denisen, Sunny Rattana on piano, Lukasz Kurzydlo ( percussion) and Marsh Titiwat Tripob (bass). inspired by her To celebrate International Women’s Day, Hotel Muse Bangkok led by General Manager Mr. Jean-Louis Barc hosted “Inspired By Her”, an event to celebrate significant achievements of inspiring and ambitious women and also to showcase the wide variety of entertainment at Medici Kitchen & Bar. Roku Gin at Aqua Bar Anantara Siam Bangkok collaborated with Independent Wine and Spirit (IWS) Thailand recently to host the Sakura Garden in Bangkok by Roku Gin at the hotelâ&#x20AC;&#x2122;s Aqua Bar, which featured specialist bartenders preparing four signature cocktails using Roku Gin. Great Kiwi celebration One of the year’s most popular events, the New Zealand Ball, drew a sell-out crowd to the host venue, the Amari Watergate Bangkok. Arranged by the New Zealand Society Thailand and The New Zealand-Thai Chamber of Commerce, the ‘Remarka Ball’ featured great music, drinks, music, dancing and traditional Maori performances. Irish ball marks St Patrick’s To be sure, the St. Patrick’s 2019 Emerald Ball at the Amari Watergate was a huge success for the many who attended this popular event and enjoyed an evening of ‘craic’ including traditional Irish food, drinks, music and dancing. SEEN launched at Avani Avani Hotels & Resorts launched its newest rooftop destination, SEEN Restaurant & Bar, the culinary brainchild of Portuguese chefpreneur, Olivier da Costa, following the success of the first two SEEN locations in Sao Paolo and Lisbon. The rooftop restaurant, lounge and garden incorporate a series of indoor and outdoor spaces at Avani+ Riverside Bangkok Hotel. International Women’s Club Rani Narula (seated front row 6th from left), President of the International Women’s Club of Thailand (IWC), hosted a Diplomatic Coffee Morning in honour of lady Ambassadors, spouses of Ambassadors and representatives from more than 20 embassies as well as Honorary Consuls to Thailand at Sheraton Grande Sukhumvit Hotel recently. The annual get-together, one of IWC’s highpoint events, was also well attended by the Club’s Past Presidents and members. Oskar’s White Party night Oskar Bistro on Sukhumvit 11 celebrated its 8th anniversary with a glamorous ‘White Party’ for all its regulars and friends. Drinks, food and conversation all flowed until late. BACARDÍ Legacy Cocktail Challenge The BACARDÍ Legacy South-East Asia 2019 Cocktail Competition was hosted in the Mandarin Oriental Hotel Bangkok, with 5 winning bartenders from SE Asia presenting to industry experts their original Legacy cocktail creations, competing for two spots at the Finals in Amsterdam in May. Saint Patrick’s Day Celebrations St. Patrick’s Day was celebrated by Bangkok’s Irish community and friends at the Surasak Ballroom, Eastin Grand Hotel Sathorn Bangkok, beginning with an event hosted by the Ambassador of Ireland to the Kingdom of Thailand, H.E. Mr. Joseph Anthony Cotter joined by fellow Ambassadors from numerous countries as well as an EU delegation. H.E. Mr. Patrick O’Donovan, Minister of State for Public Procurement, Open Government and eGovernment of Ireland was a guest of honour. BMW Group Thailand is celebrating 20% year-on-year growth in deliveries and retaining the top spot across BMWâ&#x20AC;&#x2122;s global network for the second consecutive year. The new arrivals for 2019 include the all-new BMW 3 Series, the classical BMW Z4 roadster, the special MINI Cooper S Hatch 60 Years Edition, and the comfortable new BMW C 400 GT. Mr. Hitoshi Yokohama, Chairman and Chief Executive Officer, EASY BUY PCL hosted a press conference for Umay+ Money Fitness, a storyboard design contest for a short film encouraging financial saving. Director and producer Miss Koy Ratchawin Wongviriya also joined the conference. Centara Grand Mirage Beach Resort Pattaya, led by General Manager Denis Thouvard and the hotel staff, received the winner’s trophy for the best decorated float of the Harry Potter themed St Patrick’s Day parade from His Excellency Tony Cotter, Irish Ambassador. Khao Chae, as prepared by Chef Kittisak at Radius Restaurant Cape Dara Resort Pattaya, consists of many traditional condiments including fried shrimp paste balls, stuffed bell peppers with minced shrimp, sweetened shredded fish, stuffed shallots with ground catfish, crispy beef or pork threads and more. Served with exquisitely steamed jasmine rice infused with chilled jasmine water, and served for lunch during April for 350++ baht per set/person. Hua Hin Marriott  wins G-Green chilled rice that is uniquely eaten with iced water and the scent of jasmine flowers to complement. Likewise Khao Niao Mamuang, the kingdom’s most celebrated dessert, with the mango’s sweetness perfectly complementing sticky rice blended with coconut milk and palm sugar. Available daily from 11am at The Restaurant, Dusit Thani Hua Hin from 12th-15th April, for just 190++ baht per set. Hua Hin Marriott Resort & Spa has won the G-Green (Silver) Award 2018, organised by the Ministry of Natural Resources and Environment, for implementing environmentally sustainable practices including replacing plastic straws, using eco-friendly products, watering with recycled water, adopting energysaving systems, and regularly cleaning the beach in front of the hotel. The award was presented by Mr Ratchada Suriyakul Na Ayutthaya at the Rama Gardens Hotel Bangkok. Sugar Club Phuket, the fresh international -standard Hip Hop venue in Phuket, held an official Grand Opening with a focus on featuring local artists together with international superstars and #1 Thai Hip Hop crew, Thaitanium, and our troupe of glamourous Sugar dancers supported by our 3 resident rappers, and DJs Kaze & Tracks. Wiwat Tangjitkobboon, corporate group director of Cape & Kantary Hotels, and the executive management team hosted the Annual Thank You Party 2019 themed â&#x20AC;&#x153;Under the Seaâ&#x20AC;?. The party was held at Kantary Bay Hotel, Rayong and was attended by many important clients and eminent guests.